A retirement center in Florida says an iPad pilot program started in July is helping keep residents young at heart. The iPad’s large touch screen and light weight are helping healthy residents socialize more — as they play with puzzles and games — and it’s been “pretty amazing,” the home director says with re-educating stroke and dementia patients. 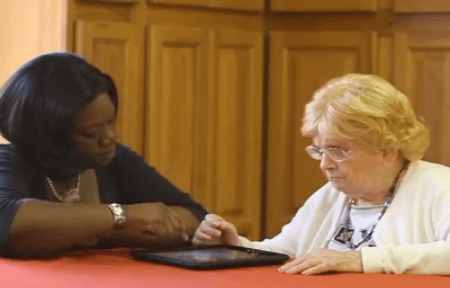 It only took three donated iPads, loaded with games,brain trainers, puzzles and language apps, to improve life at the Health Central Park nursing home in Winter Garden, Florida. One quotidian example: the Talking Tom Cat app, a freebie that features a cat that repeats what you tell it, encouraged a 99-year-old resident to drink her fluids. Despite the iPad’s success as a learning tool for all ages, the center didn’t set out to break any new ground.